I hear things. Sometimes, I even listen. Lots of tips come in, and I can't act on a lot of them. But when several regular readers told me Baang! is a favorite spot in Nusle, I put it on my list. Recently, I gave it a try. The restaurant is not so hard to get to. The 11 tram, as well as the 139 and 124 buses, stop nearby. 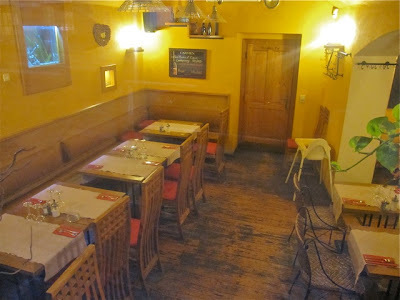 The main restaurant is not large, with only about six or seven tables. There's also a small bar area. The photo is a bit blurry because I had to be fast and didn't use a flash. 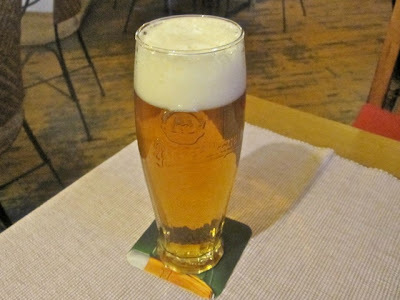 I didn't want the barman to catch me snapping the picture. 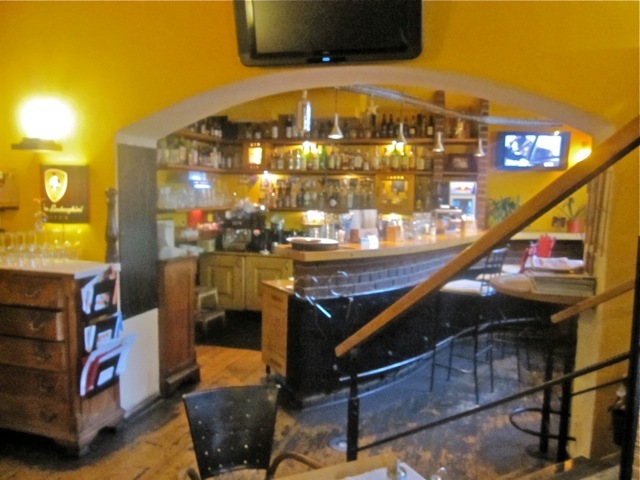 Next door, they've just opened what they call "the second door," a separate restaurant and coffee shop that operates Monday to Friday. It was closed both times I went, so I didn't get a picture. 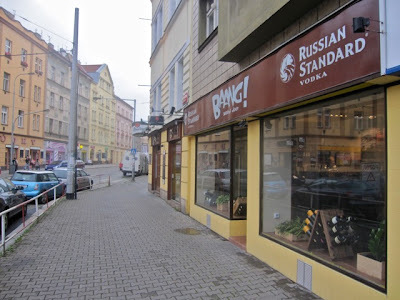 It's non-smoking, and they serve breakfast starting from 8 a.m.
On the first solo visit, I started off with a half-liter of Pilsner Urquell (40 CZK). The first one was not as cold as I'd like. Perhaps it was because I was dining quite early. The second one was better. I was in the mood for something decadent, so I ordered the dried plums wrapped in bacon (75 CZK). 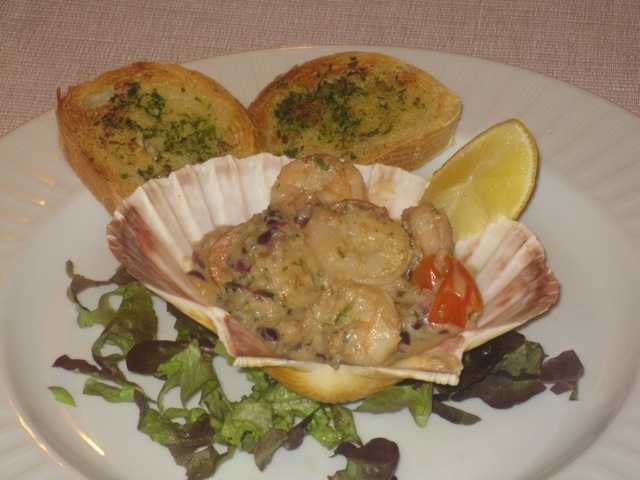 The fruit was marinated in port wine, and a walnut was included with each. The bacon was thick, meaty, fresh, and smoky. The plums were tender. It was a generous portion. 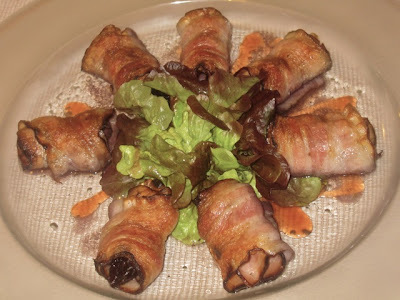 I've had this dish a few places around town, and this was one of the best. The only thing I didn't need was the sweet strawberry syrup or dressing that covered the salad in the middle. That was overkill. For a main course, I went for the Royal Skewer or Špíz Royal (245 CZK). 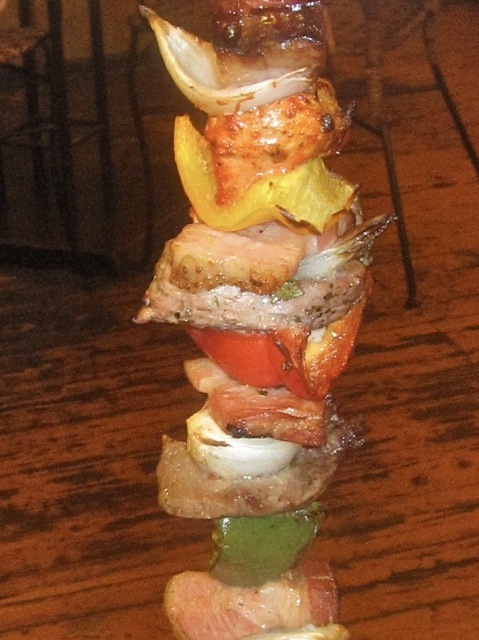 The hot iron skewer, with a mix of beef, chicken, and pork, was delivered to the table standing vertical. On the side were a cold tomato sauce, a cold garlic cream sauce, and a baked potato with sour cream. All the meats were tender and freshly prepared. The beef picked up good flavor from the grill. The chicken had a tandoori paste coating, which I wasn't expecting, but was a nice surprise. And the pork was actually thick, smoky, soft, bacon-like pieces without too much fat, depending on how you define "too much." I have a high threshold. The meat was separated by red, green, and yellow peppers and onions. The baked potato was also very good. A word of warning: the skewer is quite hot, and when you take it out of the holder, the thin paper napkin at the top doesn't protect your fingers so well from the heat. The service was always efficient and friendly. 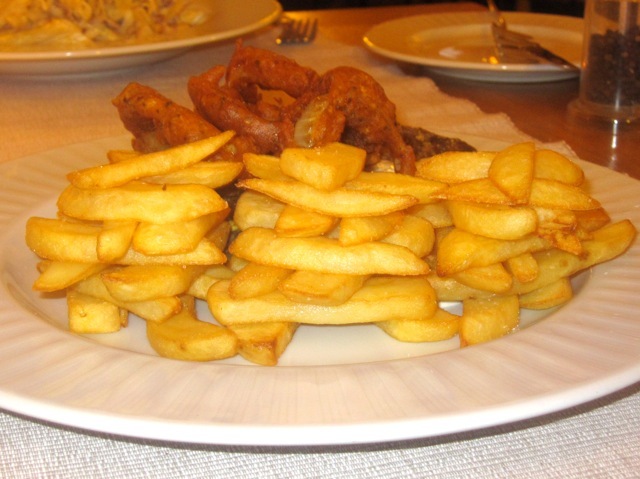 The bill for this filling meal was 400 CZK before tip. V agreed to join me for a second visit. 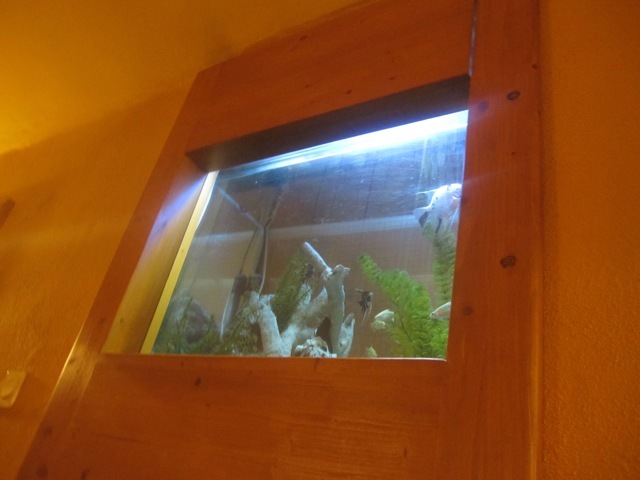 She liked that they have a fish tank built into one of the walls. 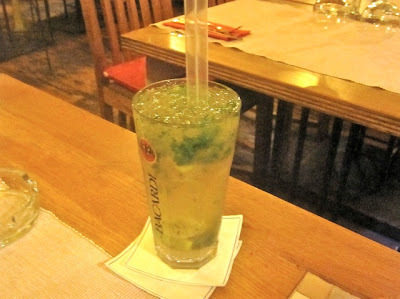 I was driving, so I ordered a virgin mojito (75 CZK). It was excellent -- not too sweet, and well-mixed with just the right levels of lime and mint. Refreshing. 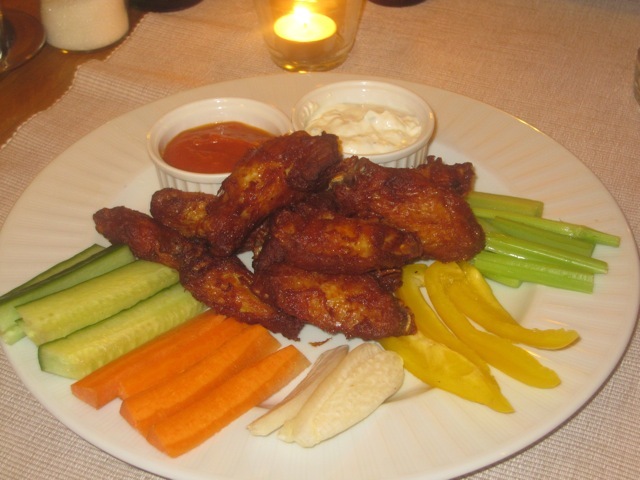 For a starter, I ordered the chicken wings (125 CZK). The ten pieces had a good, crispy, salty skin. They were piping hot, and only a bit oily. The wings came with garlic cream sauce and, oddly, tomato sauce. The menu said they came with barbecue sauce, which I preferred. I asked the waiter/barman about it, but he said they come with tomato sauce now. V tried the shrimp in coconut milk with fresh thyme (125 CZK). The shrimp were small, but cooked perfectly, with a delicate texture. She said she tasted shallots and shrimp paste, but could not detect the thyme. There was also dried coconut mixed into the sauce. Both of us thought that should have been left out. 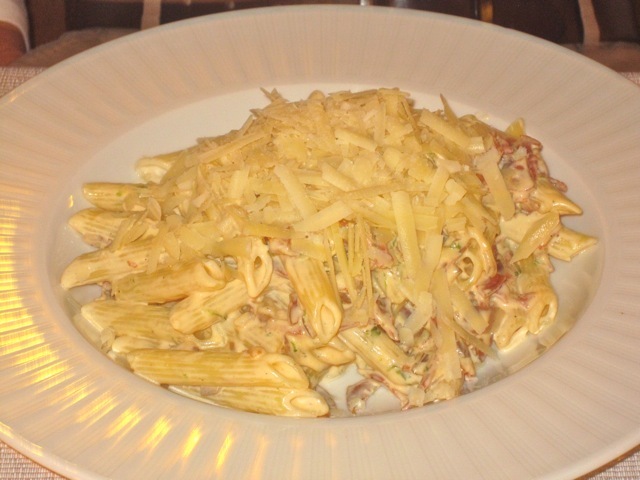 For a main course, V got the Penne Picante (125 CZK). The pasta is made with spicy Ventricina salami, red onion, and a cream sauce. The huge portion was properly cooked, and V said she liked it. The Italian salami was too salty for my taste. But she said she enjoyed it again the next day for lunch. 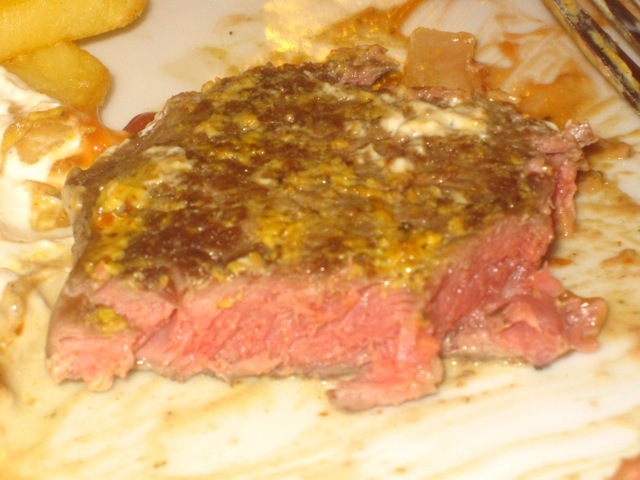 I went for the strip steak "Dijon" (275 CZK). The steak was thin, but large, and very tender. The menu said it was Uruguayan beef, and you can tell that it is a quality steak. I asked for it medium-rare, and perhaps it was closer to rare, but I didn't mind. 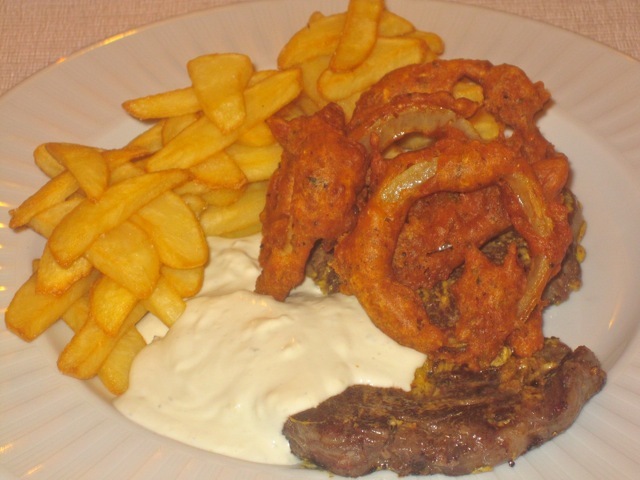 The creamy mustard sauce was OK, but I wished it was more to the side instead of drowning the beef. Also on top were four homemade onion rings. They were not completely crispy, and they were too salty. The steak fries were good, but could have been hotter. Perhaps it was because the chef took the time to build them into a lattice structure on the plate. We found it amusing, but I also wondered how long it took to get them stacked up like that. I was almost bursting at the seams from so much food, so I could not try a dessert. But they have tiramisu (65 CZK), chocolate "souffle" (75 CZK), and a few other desserts with fruit. The positive comments about Baang! certainly raised my expectations. And though it's a modest place, I'd say it met them. 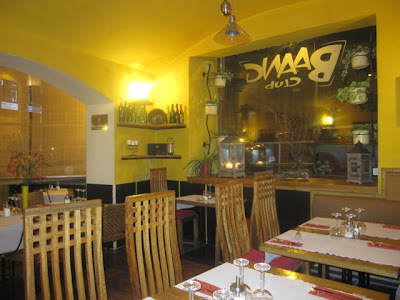 The little restaurant has big portions, low prices, good service, and usually tasty, freshly prepared, if not authentic interpretations of international dishes. It does remind me of Neklid, a favorite place near my flat that I'd describe in almost exactly the same way. And like Neklid, I'd anticipate you'll also appreciate a meal there if you're in the area. 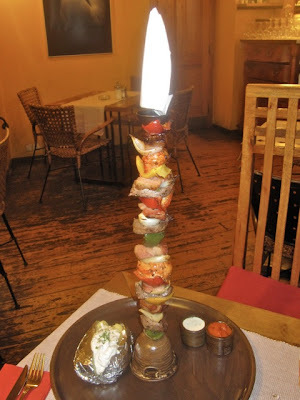 How exactly are you supposed to eat that Royal Skewer... thing... monster?! It'd be all over the place if they gave that to me.